As part of our new Gift Catalog, we created this activity guide to help you practice peace in small ways during the holiday season. Today’s peacemaking activity won’t take much. In fact, it won’t take a single word. Sit in silence for five minutes today and contemplate what role you can play in bringing peace to the world. Every day, we’re surrounded by noise and chaos. Every day, we’re introduced to new things we are told we should fear or worry about. Every day, we’re encouraged to be on the defensive and to take care of only ourselves. Today’s exercise is simple—or at least it sounds simple. Sit in silence for five minutes and open yourself to ideas on how you can have a positive, peaceful impact on your community and the world around you, without giving in to fear. Come back tomorrow for day 4! 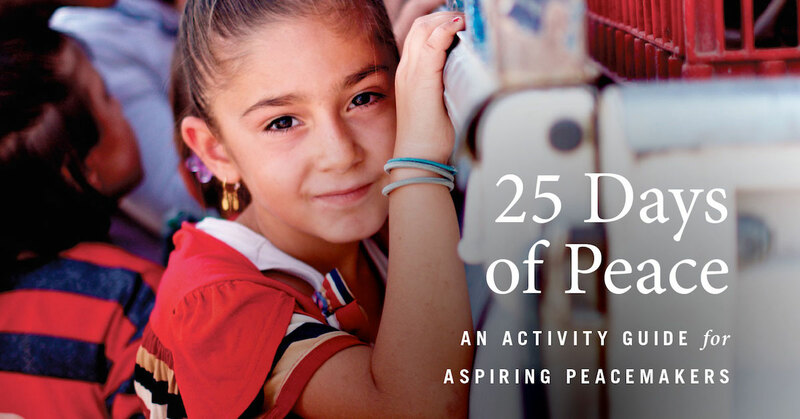 You can also view the full 25 Days of Peace activity guide here. And be sure to your peacemaking journey with us, using the hashtag #25DaysOfPeace.